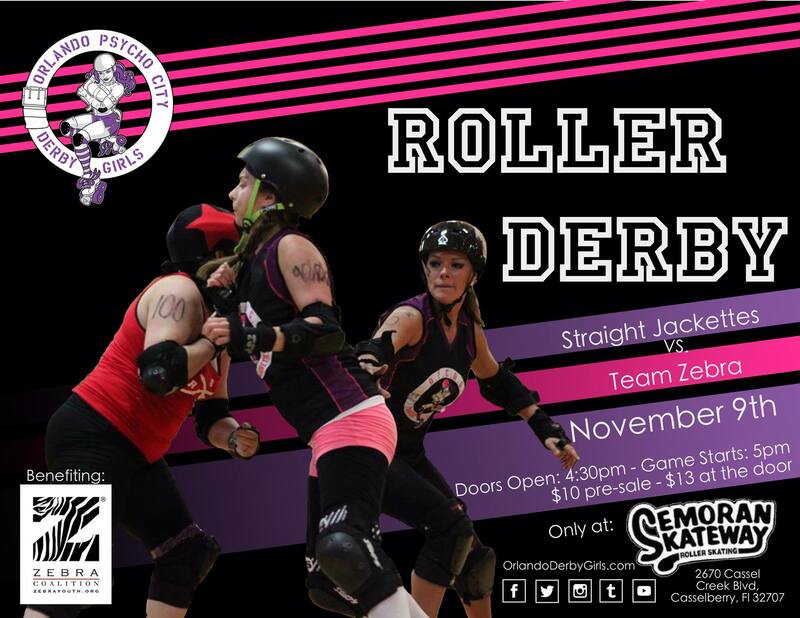 Come watch Orlando Psycho City Derby Girls travel team, the Straight Jackettes take on Team Zebra (A team composed entirely of Referees!) Doors at 4:30pm, first whistle at 5:00pm. It’ll all go down in our home rink, Semoran Skateway. Food and BEER will be available at the snack bar. We will have a 50/50 raffle, bring some cash! Remember to bring your own chairs; chairs with rubber bottoms are allowed on the track, high heels are not. And don’t forget, you can take home a piece of OPCDG with one of our league or team shirts, or even a one of a kind, derby girl made, necklaces, magnets, and more. After party will be directly after the game, at Friendly Confines Winter Park. Tickets are $10 in advance through BrownPaperTickets or $13 at the door. Come watch Orlando Psycho City Derby Girls travel team, the Straight Jackettes take on Team Zebra (A team composed entirely of Referees!) Doors at 4:30pm, first whistle at 5:00pm. It’ll all go down in our home rink, Semoran Skateway. Food and BEER will be available at the snack bar. We will have a 50/50 raffle, bring some cash! Remember to bring your own chairs; chairs with rubber bottoms are allowed on the track, high heels are not. And don’t forget, you can take home a piece of OPCDG with one of our league or team shirts, or even a one of a kind, derby girl made, necklaces, magnets, and more. After party will be directly after the game, at Friendly Confines Winter Park. Tickets are $10 in advance through BrownPaperTickets or $13 at the door.